Dr. Charlie Suggs, a native of Whiteville, North Carolina, received three degrees (B. S., M.S. and PhD) in Agricultural Engineering from NC State University in 1949, 1955 and 1959, respectively. He was the first to receive a PhD from the BAE Department. After graduation with his B.S., he was an Instructor for Dearborn Motors in Detroit, MI (1949-50), a Service Supervisor for International Harvester in Ft. Wayne, IN (1950-51), and a NC Ag. Experiment Station Branch Superintendent at Greenville, NC (1951-53). 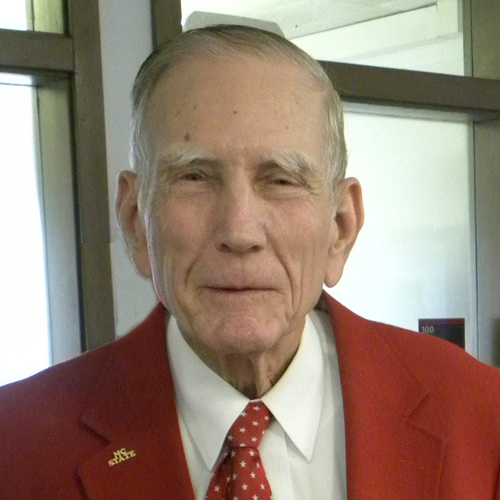 He returned to the BAE Department in 1953 to graduate school, and was then employed there from 1954 until retirement in 1993 as Professor Emeritus after 40 years on the faculty. Dr. Suggs’ major research interests were human factors engineering and mechanization of tobacco harvesting and planting. He was a pioneer in the areas of ergonomics and effects of vibration and other environmental factors on human response and performance, and use of vibration in diagnosis and development of dynamic models of the human body. He is also well known for his contribution in developing the world’s first tobacco leaf harvester utilizing the patented rubber leaf stripper which is widely employed on current commercial harvesters. To further mechanize the harvesting operation, he developed a process in which the leaves are conveyed into box-like structures to hold them for presentation to the curing environment. By 1976 there were about 2,500 mechanical tobacco harvesters on farms in North Carolina; today they are commonplace and have eliminated many hours of backbreaking work. He was adviser to 14 M.S. and 10 PhD students, having a major influence on development of leaders in agricultural and biological engineering. His students appreciated his wisdom and wit as well as his professional guidance. He had 117 refereed journal publications in his career. He has also been active in international work, serving as a consultant, in CIGR, and as a member of Volunteers for International Technical Assistance. Dr. Suggs was active in ASABE, serving as chair of NC Section, Chair of Southeast Region, editor of Power & Machinery for Transactions of ASAE, and served on several committees, such as Bioengineering, Human Factors, and Safety. He was recognized as a Fellow in ASAE in 1978. In January 1993 Charles and his wife established the Charles W. and Jane P. Suggs Scholarship Endowment. Dr. Suggs is the most enthusiastic students supporter of the department. He has attended a record number of department events throughout the years and especially likes to attend the Spring Student Award Banquet. Dr. Suggs has received the Bio&Ag and CALS Outstanding Alumni Award in 2010. Suggs, C. W., Lineberger, B. M., & Ellington, G. (1993), Paper (American Society of Agricultural Engineers), (93-6035), 8. Suggs, C. W., Lineberger, B. M., Mohapatra, S. C., & Pharamond, A. C. (1992), Paper (American Society of Agricultural Engineers), (92-1509), 8. Suggs, C. W., Wheless, J. D., & Lineberger, B. M. (1992), Applied Engineering in Agriculture, 8(5), 677. Suggs, C. W., Seaboch, T. R., & Abrams, C. F. (1991), Applied Engineering in Agriculture, 7(2), 223. Suggs, C. W., Wheless, D., & Lineberger, B. (1991), Paper (American Society of Agricultural Engineers), (91-4045), 15. Suggs, C. W., Eddington, D. L., Seaboch, T. R., & Peel, H. B. (1989), Paper (American Society of Agricultural Engineers), (89-1083), 7. Suggs, C. W., Peel, H. B., & Seaboch, T. R. (1989), Tobacco International, 191(17), 43. Suggs, C. W., Peel, H. B., Seaboch, T. R., & Smith, K. B. (1989), Paper (American Society of Agricultural Engineers), (89-6110), 13. Suggs, C. W., Peel, H. B., & Seaboch, T. R. (1989), Tobacco International, 191(16), 34.